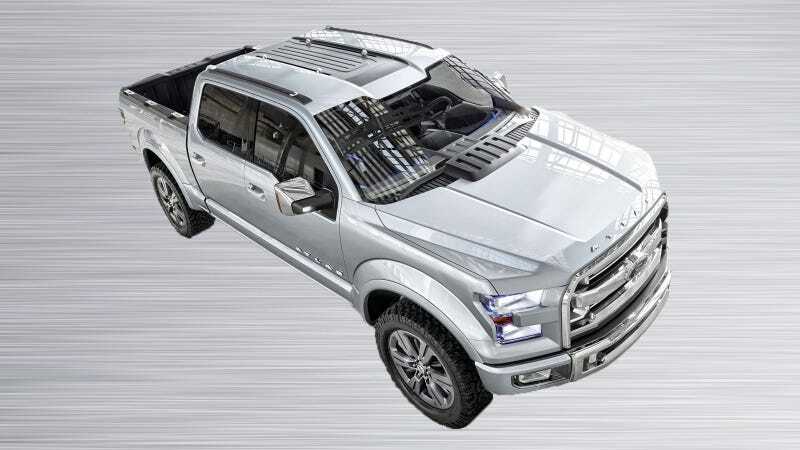 Bloomberg reports that military-grade aluminum is being prepared for the 2015 Ford F-150 display at the Detroit Auto Show, most likely to build association with toughness. This is yet another reminder that Ford's betting hard that people won't mind trading in their workhorse for a giant aluminum can. One of Ford's challenges in selling the new F-150 will be convincing pickup buyers that the same material used to can PBR is good enough for their truck. A few monoliths of battle-ready metal next to the vehicle could be a good start. Alcoa Inc, a supplier of aluminum to the US military among other outfits, has once again been confirmed as Ford's supplier for the new vehicle by "people familiar with Ford's plans." Ford utilized Alcoa in the 2004 redesign of the F-150 for heat shields, closures panels, wheels, and the hood— "the widest-width aluminum closure produced in the North American automobile market " at the time. Since aluminum manufacturing processes are significantly different from those of steel, it's safe to say major assembly-line changes will have to take place at Ford's manufacturing facilities. Analysis firm IHS Automotive estimates adjustments could require as much as six weeks production downtime. Meanwhile, Bloomberg's Craig Trudell went on to say Ford is taking on "thousands" of new employees to support the introduction of new products.